to go back to school and learn. BKC is donating 50 Backpacks & 100 Pencil Cases to fill School Student kits. 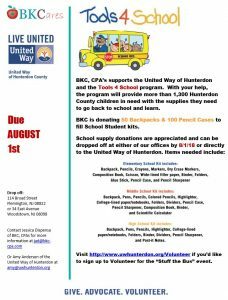 School supply donations are appreciated and can be dropped off at either of our offices by 8/1/18 or directly to the United Way of Hunterdon. Click here to see the Flyer for BKC Tools4School with desired items list.